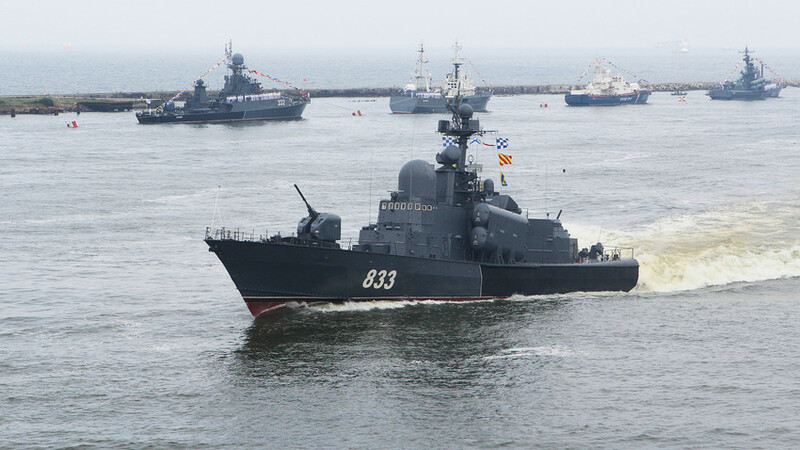 A Project 1241 Molniya missile corvette during the final rehearsal of the parade to mark the Navy Day in Baltiysk. Sometimes to move forward you need to look back: This is what Russia’s Navy has done by decking out Soviet corvettes with devastating advanced weaponry. By 2019 Russia’s military will receive two Soviet-era missile corvettes from the 1241 “Flash” (aka “Tarantul”) project, both of which have been modernized as coastal defences along the Black and Caspian Seas are beefed up. The pair of corvettes is a sudden and unexpected addition to the fleet as these ships had initially been prepared for a foreign customer who identity remains a secret. However, the contract was scrapped due to a shortage of funds so Russia added the sea machines to its ranks instead. The main differences between the massive Soviet missile corvette of the 80s and the modern version are their architecture and weaponry. First of all, designers have improved the living conditions of the crew. And secondly, the aged Soviet weapon systems have been replaced with modern X-35U anti-ship missiles and a sea version of the notorious Patnsir-S1 anti-air defense system – the Pantsir-M.
Pantsir-M is without doubt the most important addition to the ship. Ironically, the restored missile corvettes were the first ships of the Russian fleet to get these systems. The sea version will even be able to intercept missiles during heavy pitching and storms. It will also be more compact compared to the land version and will be covered with an anticorrosive sheath for longevity. What’s more, it will be able to track and shoot down up to four aerial and above-water targets at the same time with 30-mm rounds and missiles. The fire rate of Pantsir-M is also impressive. It shoots 160 artillery shells per second: That’s up to 9,600 shots a minute. “The ‘Pantsir-M’ creates a 20-km anti-aircraft dome around the ship it’s installed on. That makes it an effective defense weapon in any potential conflict of the future,” CEO of High Precision Systems that creates Pantsir-M, Alexander Denisov told Russia Beyond. Alongside a new air defense system, the missile corvettes will receive missile launch systems with eight X-35U rockets on board. These missiles will be able to eliminate any above-water targets at distances of up to 260 km. They also received internal counter-electromagnet defense systems to resist enemies’ electronic warfare. In the coming years these ships will serve as coastal defense units and in fights with sea pirates.